I have a confession to make: I forgot to take pictures in my pen turning class. I’m going to do my best to show you the steps using photos available online, but the final pen photo will be my own. Pen making requires a lot more supplies than I had anticipated. In addition to the pen kit itself you also need the wood blank, a drill bit, bushings, a mandrel, glue, different grits of sandpaper, and various finishing waxes. The class I took provided all of these for me. What are all those things, you ask? I didn’t know either. The mandrel is an attachment for the lathe that holds the wood as it is turned. The first step in turning a pen is to drill a hole to insert a brass tube into. This hole is why you need a mandrel. See one here. Bushings are small metal pieces that slide onto the madrel on either side of your wood blank. They are uniquely sized to match the particular type of pen you’re making. Here is a set. The smaller end fits inside the brass tube and the larger end indicates how small to make your wood blank as you turn it on the lathe. 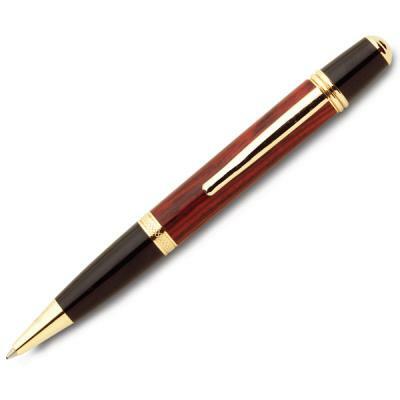 The bushings help you match your wood to the rest of the pen. I chose a purpleheart for my wood (see photo above). It’s one of those exotic hardwoods I avoided during my last project but I had no allergy problems so it’s probably safe to use again. The mandrel and a couple of the finishing waxes are available for use at TechShop. On Saturday I said that I would be back on the couch for some handwork this week, but I changed my mind. This week I’m going to show you the awesome pen that I made at a pen turning class a few days ago. I was amazed at how easy it was once someone showed us the right tools for the job. I see some handmade Christmas presents in my future. I made these! This was one of the more satisfying projects I’ve done so far. But yikes, I didn’t notice until I was editing this photo just how crooked the base of the tall candlestick is. Oh well, I’ll just turn that part to the back. – Slow and steady wins the race. When I am tired and trying to rush I make mistakes. Last night I cut myself, left a bunch of imperfections in the final candlestick, and drilled a hole right through to the outside of another one. All stupid mistakes I wouldn’t have made if I allowed myself more time. 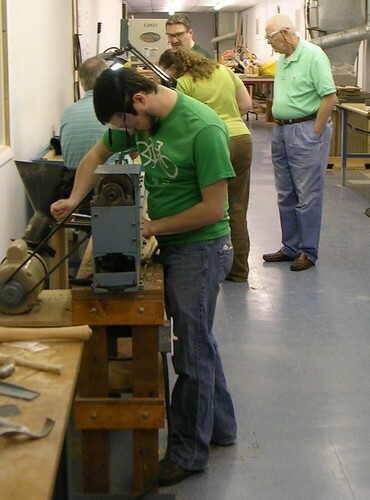 – Woodturning is fun! I’m definitely going to do it again soon. Everyone on my list might be getting handmade candlesticks for Christmas this year. – I am not allergic to maple. Whew. I’m taking another class this weekend to prepare for next week’s project. I hope you’ll come back to check it out! Because this blog is mostly a solo activity, and because taking photos while holding a sharp tool to a rapidly spinning piece of wood feels dangerous to me, I thought I’d take a moment to show you some videos of wood lathe experts that inspired me.